PopSockets are a fun and functional accessory for electronic devices. This repositionable “cool tool” grip expands and collapses by way of an accordion mechanism. This mechanism “pops” up whenever you need to chat on the phone, text a friend, watch a video or get a better grip on your phone, tablet or eReader. It’s simple to use as you simply click on the PopSocket and it will pop up to create the grip area. The PopSocket has two “pop” stages (or levels) to suit your need and comfort level. By comfort level, we mean a “sweet spot” that can easily be gripped by the operator. PopSockets are made of hard and soft plastics that are designed to expand and collapse 12,000 times! If the PopSocket unsnaps from its base, just snap it back together. PopSockets conveniently fold down to carry in a bag, purse, or pocket – we promise you’ll barely notice it’s on the back of your phone! Billboard-size exposure for your brand! This translates into 8,000 impressions per PopSocket per year – so about 1670 impressions for every dollar you spend. Compare that with a Super Bowl commercial, as a $4 million commercial has a potential 100 million viewers, generating about 25 impressions per dollar. PopSockets are 67 times better (and 100 times cooler). Activities Accessory: Smartphones slip out of your hands easily, so PopSockets come in handy when you are doing various activities like powerwalking, bicycling or running. You can even use a PopClip to mount your phone on your bicycle, treadmill or elliptical. Easy Grip:PopSockets make great grips, making activities like taking one-handed selfies, hands-free talking or texting incredibly easy and smooth. Video Calls:You can easily mount your phone on your laptop while on a video call, allowing you to go hands-free so that you can multi-task by continuing to type on your laptop while you talk. You can also use the stand so that you don’t have to hold your phone or device. Media Stand: PopSockets make amazing stands. You can ‘pop’ them for easy use as media stands to watch videos, take group photos on a self-timer or even use your phone as an alarm clock by the bedside. Protection from Wet Surfaces:This is a true bonus of the PopSockets. Sometimes you can’t help it, your smart phone ends up on or near dirty or damp surfaces. Considering the damage this can cause your phone, the added protection from the PopSockets stands will be truly appreciated. Pop sockets are made from polycarbonate, TPU and polyurethane making them washable. Hence, you can mistakenly put your phone on wet surfaces like by the sink, floor or the kitchen counter without it getting your phone wet. This also means your phone won’t get dirty from resting on all those surfaces throughout the day, our PopSockets will “take the hit” and they are far easier to clean! Earphone Management System: You can wrap your earphones / earbuds around your PopSockets to keep them in one place and tangle-free. Now you won’t have to wrap them around your cellphone, covering up part of your screen. Double Duty for Large Devices: PopSockets make holding big devices such as tablets and e-readers easy, comfortable and secure. You can also use them for smaller devices such as GoPros. Slide:How many times have you passed your phone so someone else can see your photos, watch a video or talk to a friend? If you want to pass your phone to someone on the other side of the table, use the PopSockets side and your phone will easily slide across the table without you having to get up. Gaming: You can turn your phone/ tablet into a joystick by attaching two PopSockets to the back of it. Fidget Toy:Playing with PopSockets is addictive! Try to stop popping them, we bet you can’t. They are great stress busters and fun to fiddle with. Your kids will love them too! Each PopSocket comes with a PopTek adhesive pad, a thin layer of reusable, residue-free, adhesive gel. You read that correctly! The pad is reusable and the gel leaves no sticky residue. The gel forms an adhesive bond of various strengths with different surfaces. It attaches to most phones, tablets and cases. If your PopTek pad gets dirty when detached, simply wash it with soap and water and let it air dry completely to return its original stickiness. PopSockets do not stick to all devices and cases – especially those made of silicone or those with a waterproofing coating. PopClips add value to your giveaway! Your customers can easily purchase a companion piece to holster the logo’d PopSockets at many stores and shops. Remember, we told you this promotional product came right off the retail shelves. These custom cellphone accessories are called PopClips and they mount to nearly any surface which makes the PopSocket you gave customers and employees loved even more! With this holding clip adhered to the dash of a car, they’re ready for hands-free driving. Or, put a clip on a mirror to watch the news while getting ready every morning. Add a second clip to a bedpost, slip in the PopSocket and watch movies on any device. These useful promotional products were created in 2012 in Boulder, Colorado, by David Barnett. David is now the Chairman of the Board after funding his invention with an extremely successful Kickstarter campaign. 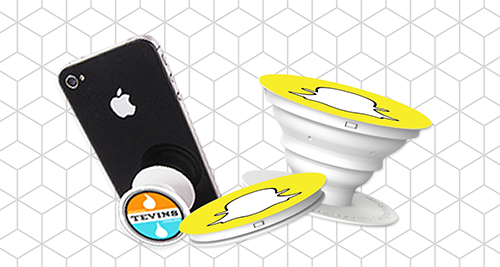 ePromos has PopSockets for as low as $4.19 and will imprint your logo on each one. Full-color imprinting is available at an additional fee. Included with each PopSockets is an insert card with instructions & recycled packaging.